Or, to be more accurate, it scared me until recently. I avoided it. Not because it wasn’t tasty, but because it wreaked absolute havoc on my digestive tract. If you’d asked me, whomever was making up songs about beans, should have been singing about quinoa. Maybe it didn’t rhyme as well? I tried quinoa for the first time several years back, and have always liked the taste of it. Both red and yellow quinoa are delicious, and a great addition to any substantial salad. But every time I ate the little, harmless looking grain, I regretted it. 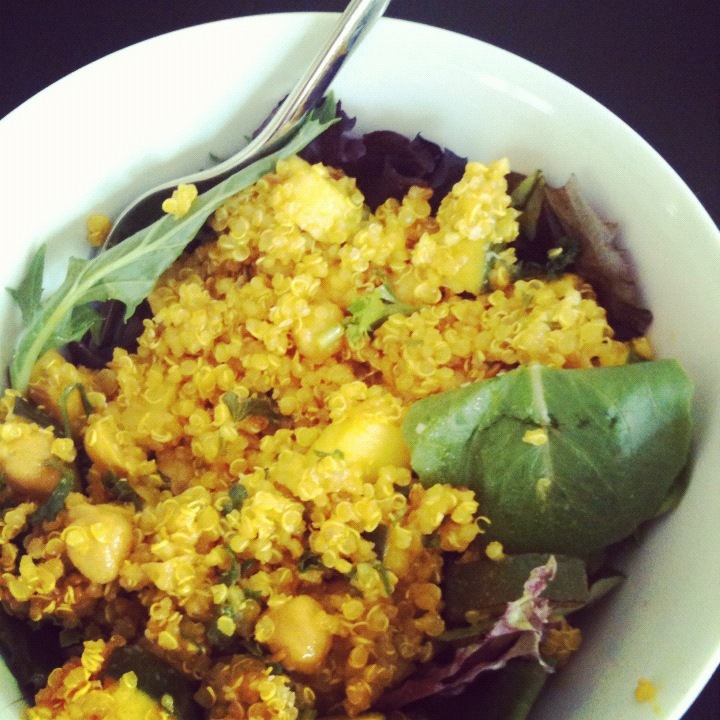 I stopped buying it, and started substituting in other grains in recipes (cous cous works well!). But then, a few months back, my friend Brenna needed to clean out her pantry, and I reaped the benefits. Which included a 5-pound bag of organic quinoa. I couldn’t let it go to waste. Turns out, there was a very easy solution to my problem. A solution that is written as plain as day on all bags of quinoa and most recipes that call for the grain. RINSE WELL before cooking. I’m not sure why I always thought I was exempt from this step. Apparently I thought I was above rinsing? Pretty sure I was just lazy. Or I didn’t know why rinsing was necessary. My quinoa always looked pretty clean. Turns out, rinsing removes the saponins, which aids digestion. Well there ya go! Needless to say, armed with this newfound trick up my sleeve, I’ve been cooking up a storm of quinoa the past few weeks. I’ve listed some of my favorite recipes below. I recommend you try one. Just don’t forget to rinse! This recipe incorporates lots of healthy foods, from the quinoa and chickpeas to the turmeric and cumin. We only have a little Weber grill that requires too much effort for just grilling some squash, so when I make this I chop the zucchini and saute it in my Le Creuset with spices before adding to the salad. This salad is heartier than expected, and tasty of course. However, I significantly cut the garlic in the pesto, or I find it much too overpowering. But to each their own! This recipe is from one of my new favorite blogs, Cookie + Kate. It’s a perfect salad for an early summer night when strawberries are in season. P.S. – Quinoa is gluten-free.